Our love affair with brands. Understanding the importance of customer experience and exceeding customer expectations. In any successful relationship, trust is built up over time, and every interaction can have a positive or negative impact on the level of trust in that relationship. The relationship between customers and brands is equally built on trust and determined by every interaction a customer has with that brand. Customer loyalty is a key measurement and driver in brand building - understanding what brings the customer back is at the heart of success. Brands need to focus on their interactions with customers, throughout the customer journey, so as to ensure they build trust and loyalty. When it comes to analysing your brand’s customer experience, it is important to first understand your brand: what you stand for, what is your offering and what sets you apart from your competitors. BrandMatters has developed a simple Brand Diagnostic Tool to help you get a clear picture of your brand and identify the areas you need to improve upon. Simply satisfying your customers is no longer enough, brands need to create strong and long-lasting relationships with their customers. To demonstrate how brand and CX come together, BrandMatters have developed a diagnostic system to measure how these components come together. Customer is in control – Customers feel that they’re in control of their journey and able to make their own decisions along the way. Provides good value – Customers receive what they expect, with no hidden fees or surprises, ensuring all service goals are reached. Available and accessible – Customers can reach the service/product through the channels its customers expect, as well as being available at all expected touchpoints. Easy to use – Information is easy to find and where you expect it to be, ensuring the CX is as intuitive as it can be. Supportive – The brand provides the right information at the right time, explaining each of the steps and helps the customer along the CX journey, making the customer feel supported. Tailored – Information is relevant to the audience and its expectations - it anticipates its needs and design its interactions to meet these. To understand how this works, the BrandMatters' team have selected some of the brands they believe succeed in creating positive customer experiences in various ways. We applied scores across each of the 6 criteria to see how each brand scored in relation to each other across the criteria. Our team chose a cross section of brands in various sectors with a few Australian brands included. 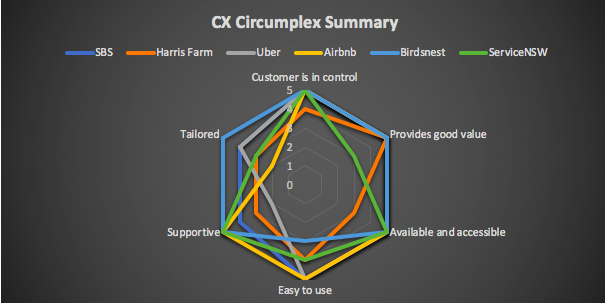 The brands we assessed include – Airbnb, SBS, Uber, Birdsnest, Service NSW and Harris Farm were charted across a CX Circumplex Summary. The above circumplex depicts all of the brands we assessed and how they rated against each of the attributes. Compared with all of the other free to air channels, and even compared to Netflix and Foxtel, I find SBS exceeds my expectations as far as educational, inspiring programming is concerned. The fact that is free to air, as well as available on demand (with not too many commercials), means it is accessible to all Australians regardless of geography, age or cultural background. + Their programming is all free (compared to Foxtel, Netflix etc) there is a range of varied programming that appeals to many diverse consumer groups. It is also tailored and addresses minority groups, special interest and educational subject matter. + Online content (such as email, blogs etc) is also great – lots of value-added content relating to subjects of interest to their audience (eg: recipes, interviews, news articles, business articles). There are many reasons why I love Harris Farm Markets. They have recently upgraded the store near where I live, and it has exceeded my expectations as far as a grocery shopping experience goes. Competing with Coles and Woolworths can’t be easy – especially from a purchasing power perspective. + The store is interactive, lots of staff roaming around allowing you to try before you buy. + Freshness and quality wins over price in terms of value. The Imperfect picks is also a good option for price sensitive customers. + The offering of extended grocery options (all environmentally friendly alternatives are great). + Their focus on sustainability – they were the first to ban the plastic bag. Slightly predictable and cliched, but I can’t go past Uber – especially in the context of their competition, traditional taxis. They do have alternative ride sharing competitors, but I haven’t found a reason to trial them yet. + Price estimates, wait times advised, rating system allows quality control. Conversely, with taxis, I have no idea on anything – wait time, car quality, driver quality. + In terms of value for money – at least it is transparent (the surge pricing can sometimes mean the value for money attribute can become an issue). + Easy to use, intuitive app. Automatic payment post service completion. + Airbnb provides an array of filters from number of rooms and price range, to whether you’d like a spa and fireplace – allowing users to feel in control of finding the exact personalised experience they are searching for. + Extensive range for all occasions. + Airbnb has recently extended their offering into experiences which is a natural extension. I have recently discovered the Australian based online clothing store, Birdsnest. I purchased my first item a few months ago and was extremely impressed with the experience - it really felt like a personalised shopping experience and even down to how the items were delivered felt tailored and exceeded my expectations. + An easy to navigate website, with outfit “suggestions” linked to specific occasions, eg travel, work, weddings. Style “capsules” recommend outfits for specific looks, eg casual looks, boho looks, weekends away. + Clothing value is matched by the quality which is often not the case with online clothing brands. A bonus surprise was a bunch of discount vouchers that arrived with my purchase – a smart marketing initiative to encourage repeat business. + Stock is regularly refreshed, kept in a central location which means it is all shipped together. + Interactive in terms of online shopping experience – recommends clothes for your body shape as well as matching accessories. + Good return policy plus offers secret discounts for repeat business. + Showcases a variety of models wearing the clothing (rather than just size 6 catwalk models). I normally don’t look forward to dealing with the admin work I need to do for government agencies as they tend to be unintuitive, bureaucratic and take up a lot of my time - but I was pleasantly surprised when I recently renewed my license at ServiceNSW. + I could choose multiple service offerings and choose whether to do them myself or with some assistance or completely assisted and over the counter. Every point was explained, and I could opt-out at any point. + Allowed me to easily compare the different price options and choose the best one for me. + I can use the service digitally, over the phone with a translator, in a branch, in a branch – but online with someone walking me through the process. It is very accessible, and the in-store experience is designed to help me learn how to use it online. So, what do brands need to do in order to deliver on, and exceed their customers’ expectations? Uncovering powerful consumer and market insights and building your brand strategy from there means you will be one step ahead when it comes to building out customer experience and ensuring your brand remains consistent and clear. Through brand research, you can uncover your consumer’s preferences, their habits, their emotions and their desires. Once you have a deep understanding of your customer, you can develop customer personas. A customer or buyer persona is a fictional representation of your ideal customer – based on the facts you have gathered from research and understanding of your real customers. The development of personas helps you continue to attract and appeal to your ideal audience and build a deeper connection. The more in-tune you are with your target audience the more likely you are to build a strong relationship with them and develop loyalty and advocacy. A brand is a promise kept, so ensuring your brand delivers on the promises you make is critical. Developing and implementing proof points that resonate with your customers is vital. Consistently demonstrating these proof points to your customers is an important part of your brand strategy. Continual evaluation of your brand’s performance across these key customer experience drivers is essential. The best brands don’t just make good products or provide good service, they exceed expectations along the entire customer journey. This is not something exclusive to big budget, long standing brands - in fact many new brands such as Netflix and Spotify are really paving the way in putting CX first and considering the ease, accessibility, customer-centric drivers to propel their brands forward and win the heart of their customers. At BrandMatters, we specialise in helping you get to know your customers. Through our proven methodology where customer, market and competitor insights are gathered, analysed and then utilised to develop winning brand strategies. BrandMatters are experts in brand strategy and have a deep understanding of the interactions between brands and CX. Get in touch to discuss how you can truly understand your customer and drive deep brand loyalty.